A linguist with the weapon (ability) of seeing the future knows that she will marry the man who stood by her in her quest to cohere two civilizations that are light years apart, to preempt the world community from making history’s greatest error of judgment and to finally bind them in unity for posterity. She knows that he will father her daughter who is going to leave them prematurely as she would helplessly sleep holding her dying body as she slips away bit by bit from her grip. She knows that when she will predict to him about that loss, he’ll walk out on her, telling her that she made a wrong choice (in everything). Still, when she'd be proposed by him, she’d agree regardless. A heartbreaking personal price that Arrival’s protagonist has to pay for the ability to gift humanity a historic makeover. Suffice this should to underline the human element within the science fiction that ‘Arrival’ purports to be. 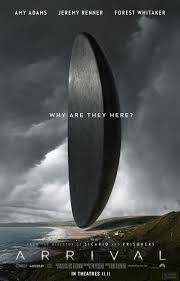 Intricate emotional layers aside, the story of “Arrival” is lucid — aliens arrive and then we contact them and whatever follows, follows. 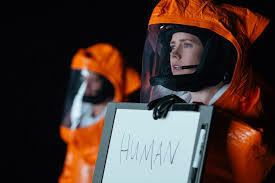 Amy Adams plays Louise Banks, a linguist who is called in by the U.S. government when the arrival happens. One sliced egg shaped UFO above the grasslands of Montana, and eleven more descend at other locations around the globe. Louise, along with a physicist (played by Jeremy Renner), is tasked with establishing contact with the visitors from far space and decode why they are here. They meet their hosts, two giant, squid-like beings that float on the other side of a see-through barricade. Verbal communication attempts yield complex outcomes, but written words and images bring promising results. Communication with the creatures moves slowly, but it at least begins to move. But here is the challenge. If we are trying to understand a culture fundamentally different from our own we could not simply gather statistics, analyze grammar, and make conclusions. We’d have to absorb a different way of seeing. We'd have to find out how words are being attached to meaning. It is here that the movie makes us realize that language isn’t just about understanding how to say things to someone and ascribe meaning to what comes back. It tells us language has deeper roots in civilizations and the way they flourish and grow rather than just being a mode of communication. The film is replete with flow of intricacy which keeps you dangling on the verge of guessing and taking back those guesses about the possibilities that those seem to be opening. Toying with the danger of drowning the viewers in enigma, Villeneuve challenges himself as a storyteller/filmmaker and he comes out with flying colours by dosing the audience with crucial, orienting pieces of information without any ground shattering violence or action. And a part of the movie’s stunning brilliance must have to do with Ted Chiang’s spectacular short fiction ‘Story of Your Life’, published almost a decade ago, of which the movie is an adaptation. Right from the moment the opening scene plays, it’s clear that we’re in for a reflective expedition through memory, time and crushing grief. Die hard sci-fi admirers may not soon understand the import of such a premise in an alien invasion movie. But the story has criss-cross layers to make you hold on despite a very slow progress and the absence of the entire over the top stuff we have come to expect from science fiction features. The seminal subject of fate, loss and the meaning of love are so smartly interwoven with science that the film’s grip over you never loosens inspite of the so called slow progress. The director’s courage in not sacrificing narrative for entertainment is amply rewarded when the crafted pieces of his art suddenly come together to make sense. As one leading journal has written, the film is a profound example of how the best movies are those that allow the narrative and entertainment to coexist in unforced, tolerant balance. Imagine the conundrum which the protagonist has to deal with. To know that if she creates a life, it’s going to end prematurely, brutally and dissolve the cohesion of the most priceless bonds. Yet, she embraces that future. Yet, she chooses to bring that life into existence. Watch it grow, smile with it, play with it, and sleep with it on the same bed, helplessly witness it wilt abruptly and die. The question you cannot help asking yourself in that moment is should we meddle with future if we are able to foresee it? Beyond the sci-fi narrative ‘Arrival’ makes this tantalizing probe. But by the time you arrive at that point you’d have already lived a brilliant unfolding of a never before experienced story about human alien relationship. One that is far from being gory or from being driven by a motive to annihilate or dominate. When the decisive rendezvous happens, contrary to accumulated expectations, it turns out to be meaningful instead of menacing, meditative instead of adverse and peaceful instead of violent. You cannot help but admire with a smile the clever use of restraint with which you have are made to experience a genre of storytelling often characterized by conflicts of colossal proportions. Arrival, is as has been aptly put, a stunning science fiction drama about linguistics, aliens, and how we live today. Chances are that after watching it you’ll come out of the theater with a lump in your throat besides the feeling of having been overwhelmed by a rainbow of feelings . Wow ! What a mesmerizing movie it appears to be ! Thanks for enlightening through your wonderful review. It's to be caught ASAP. A Must Watch. 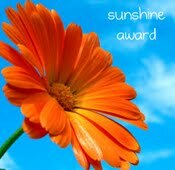 Thank You for reading Jitendraji. i love science fiction movies, your review made me more interested about this one. very nicely written. Thank you Jyotirmoy. Please go and watch it. It's simply profound. Though I am alien to aliens, your review is impactful. I am more into crimes and thrillers. But you gotta watch this. It isn't a typical alien invasion movie with bombastic action and thrill but it'll leave you thinking. Let us know how you felt about it if you watch it.